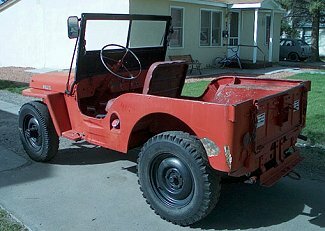 "I acquired a 46 CJ2A, column-shift, #18843. It had lived at the Gunnison Colorado airport since the late 1960's. It was utilized as an aircraft tug and general purpose vehicle. Unfortunately, it has been converted to an F head engine and stick shift. However, some of the column shift linkage remains as does the data plates. It's early production shows since it retains the solid military style wheels, steering wheel and in fact remnants of a leather transfer lever boot. Somewhere underneath all the bondo lurks the original steel! Also I have located another column-shift Jeep #22015. It is in very good original and unrestored condition. Hopefully the owner, who has it parked out in a field, ouch! !, will someday decide to part with it."